Inspired by the Vietnamese "An sáng" - breakfast - with its array of scrumptious dishes, we aim to re-create the breakfast buzz and laid-back atmosphere of Saigon's alleys, all in the comfort of your own garden! Please note: this menu is only available for a minimum of 15 people. Soy & black sesame Beef Skirt in Betel Leaf. Craft your own rice paper rolls with fresh barbecue fillings.Roll them up with rice paper, vermicelli noodles, cucumber, lettuce & fresh herbs. Have fun & keep rollin'! Kem Dừa - Coconut Ice CreamCaramelized Ginger, toasted black sesame, coconut shavings, crushed peanuts. The menu Barbecue Brunch is unavailable at that date. Chef Luisa Orlando is unavailable on this date. 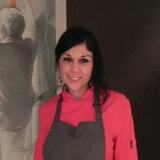 Check chef Luisa Orlando's calendar. Chef Luisa Orlando is unavailable in this city.